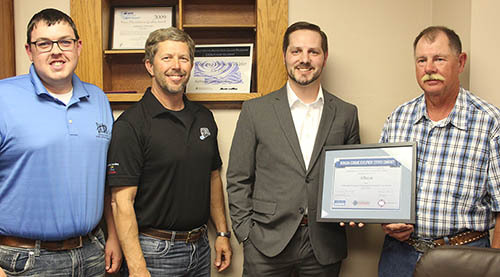 On hand for presentation of the recertification plaque from the Nebraska Department of Economic Development were (l.-r.) Mitch Glesinger, BCDA office administrator; Doug Koch, BCDA executive director; Jason Guernsey, DED business recruitment manager, and Albion Mayor James Jarecki. City of Albion last week received recertification as an Economic Development Certified Community (EDCC) from the Nebraska Department of Economic Development (DED). A plaque was presented to Albion Mayor Jim Jarecki by Jason Guernsey, DED business recruitment manager, and Kelly Gewecke, DED business development consultant, during the Albion City Council meeting on Tuesday, May 10. 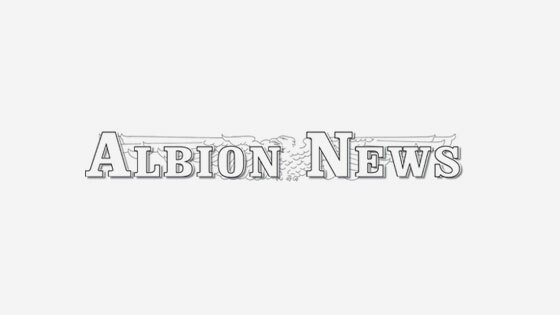 Albion is one of 38 communities to earn EDCC certification. 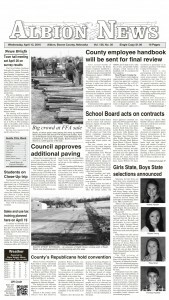 The program is sponsored by the Nebraska Diplomats and administered by DED. State officials established the program in 2005 to recognize communities for their preparedness to attract new industries and grow existing businesses. Details in the May 18 Albion News Print and E-Editions.